6000 sq. foot Colonial, 5 Beds & 5 baths, living room, dining room, gourmet kitchen, large family room w/ fireplace, Florida Room w/ large brick entertainment terrace framing tropical pool, spa, and 1100 Square Foot Luxury guest cottage. 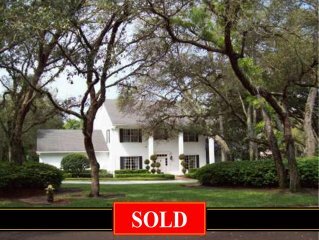 Sweetwater Club is a well established, much sought after, appreciating community that is comprised of approximately 175 well-manicured estate homes on large one to eleven acre lots. A private, 24-hour guard gated community with wide windy roads, well-landscaped boulevards, and community tennis & basketball courts. The children of Sweetwater Club have access to the very best public school system in all of Florida. The elementary, middle, and high school are all highly ranked not just in Florida but across the country as well. Developed on what many consider to be Seminole County’s best 330 acres, Sweetwater Club sits approximately 50 feet above the Wekiva River Basin. The estates on Millionaire’s Row sit high and dry above a valley of acres of hundred-year-old oaks dissected by a slow winding creek. This picturesque park like setting is found nowhere else in Florida and ensures not only privacy but virtually guarantees phenomenal drainage as well. Sweetwater Club residents enjoy a privileged lifestyle in a country club setting. Golf, tennis, fine dining as well as social memberships are available at the newly renovated all-Private Sweetwater Highlands Golf Club. Enjoy unspoiled paradise with an afternoon of exploring, canoeing, hiking, or bird watching in beautiful Wekiva Springs State Park, an 8,000-acre nature preserve. Residents have privileges such as beach volleyball, use of a picnic pavilion, or water-skiing with access to all private spring fed 269-acre Lake Brantley. Sweetwater residents have enjoyed this privileged lifestyle with steady appreciation. Little wonder, as there will always be new communities with nice homes on ¼ acre to ¾ acre lots, but never again will there be a community such as Sweetwater Club! Welcome Home! $1,250,000.